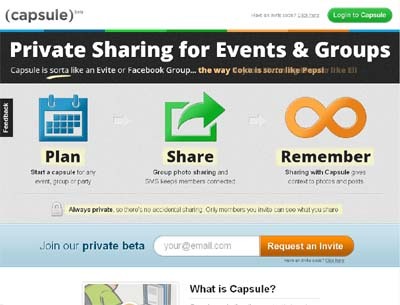 Capsule is an event planning website established to help people plan, share, and remember group experiences. With fluid communication tools and a blazing fast photo/video uploader, Capsule allows a user to plan an event, share photos/videos from that event, and then archive all the communication and media. Creating a digital group scrapbook directly focused on one life experience (e.g. family wedding, an amazing vacation, a study group for school). Capsule offers much more than any contemporary event planning site does. We have created the future of event planning/social networking sites.